Ecology is the interdisciplinary scientific study of the interactions among organisms and their environment so you will study the planet earth and the interactions of its inhabitants (plants, animals, and the physical environment). As such, it is concerned with the network of relationships among small –scale biological systems such as organisms, complex interacting systems such as ecosystems, and the physical and other non-biological aspects of their environment. Structure: Building on a solid foundation of the biological sciences, students diversify in three foundation areas: physical environment, plants and animals. Uniqueness: This program allows students to understand the dynamic interactions of the physical environment, plants and animals. Ecologist. City Planner (urban ecology). Environmental consulting. Nature education. 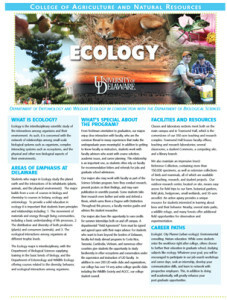 While some students enter the workforce right after college, others choose to further their education in graduate school, studying subjects like ecology. Whatever your goal, you will be encouraged to participate in our job-search workshops and career days, seek an internship, develop your communication skills, and learn to network with prospective employers. This, in addition to doing well academically, will greatly enhance your post-graduate opportunities. For more information, visit the UD Online Catalog . If native plants are altered, do bugs and birds suffer?